The algorithm updates unveiled by Google earlier this year put mobile firmly on the minds of business bosses everywhere. 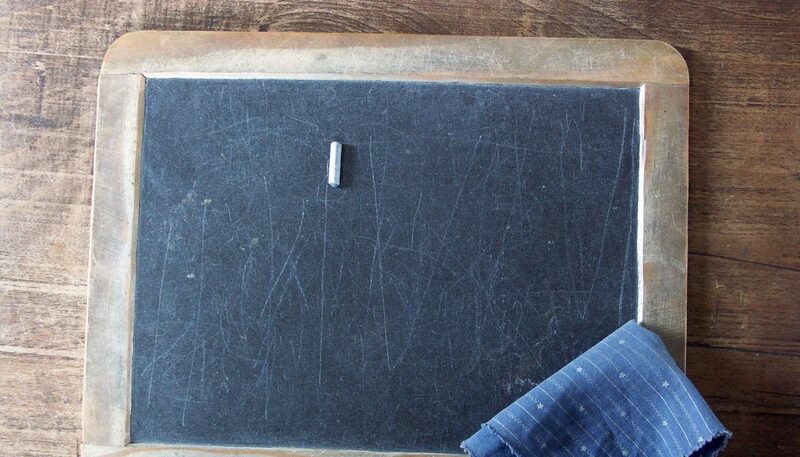 It’s a shift we’ve spent a lot of time thinking and talking about, as a quick glance at the Learn section of our site will tell you. In the hope of providing some real context to this major transition, we thought we’d ask you about your own mobile content habits. We got straight to it and set up a survey; here’s what we learned. First and foremost, we found that a big portion of you are pretty much glued to your mobile screens. 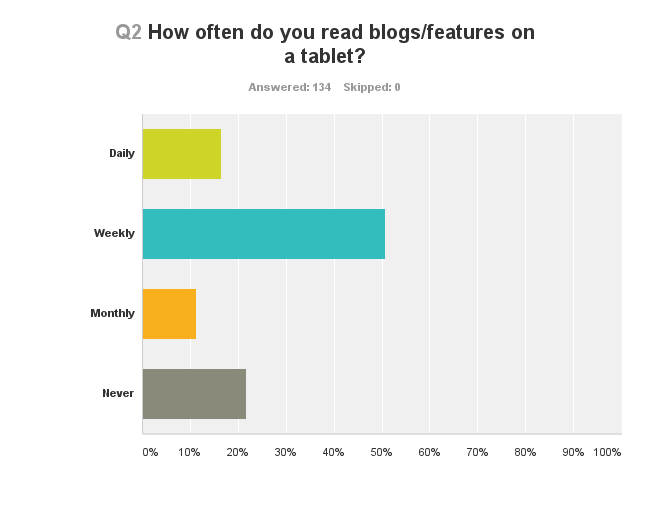 Of all the people we spoke to, a whopping 87 per cent said they read at least one blog on their smartphone every week, with almost half of these (47 per cent) reading daily. 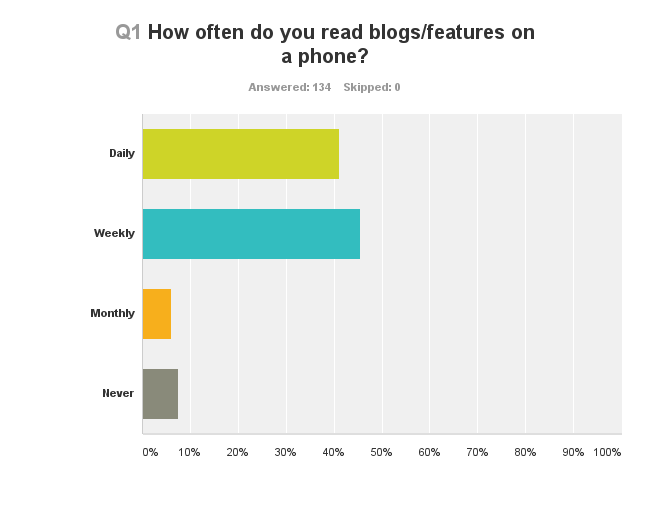 What stands out the most in this part of the study, however, is the fact that only seven per cent of the people we asked said they never read blogs on a mobile phone. The first objective of content creation is to get your work in front of people, so shareability is crucial. 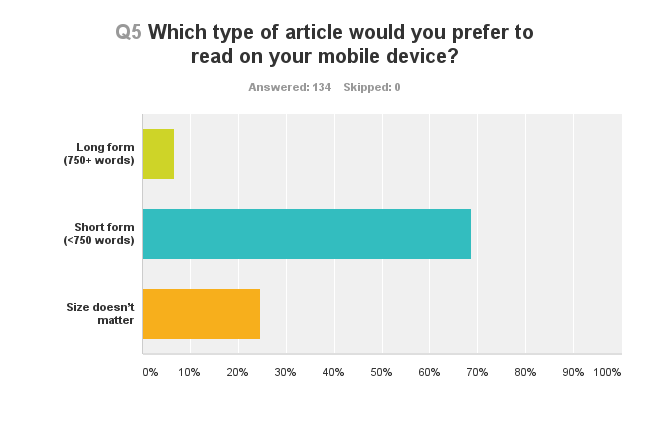 While studies already show that long-form content is – albeit a little surprisingly – more likely to be passed on from reader to reader, we wanted to know whether device-type had any influence…so we asked. 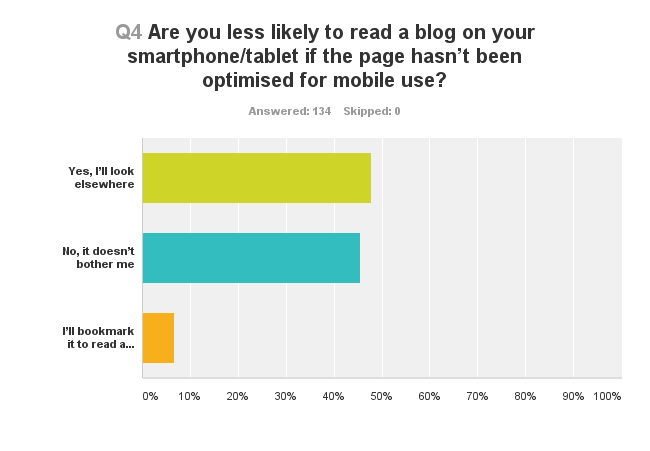 Truth be told, we were a little surprised to find that 45 per cent of people aren’t put out if the article they want to read hasn’t been optimised for mobile use (some said it depends how good the article looks), but that still leaves 55 per cent – the majority – who do care. Of these, 12 per cent said they’d save the article to read on a desktop later on, but the rest will leave to find something else. In other words, fail to make your pages mobile-friendly and you’ll instantly lose a big chunk of your audience. It wasn’t long ago that we were comparing long- and short-form content on our blog, and coming to the conclusion that both really do have their benefits. Our results do show, however, that most people (68 per cent) seek out shorter articles (750 words or fewer) when using mobile devices. Only seven per cent said they’d prefer to read long form, with one in four saying size doesn’t matter. The key is to find a balance between long and short. Our results only further support the idea that shorter articles should be produced more regularly, but don’t let that take away from the importance of concise yet informative long-form content – it has an important role to play in your strategy. 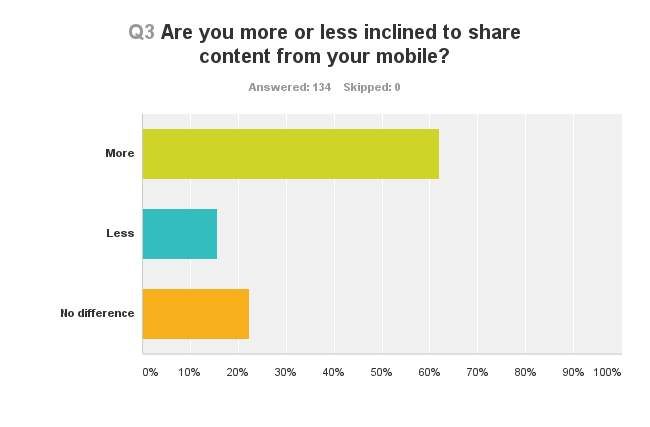 How does your content fair on mobile? 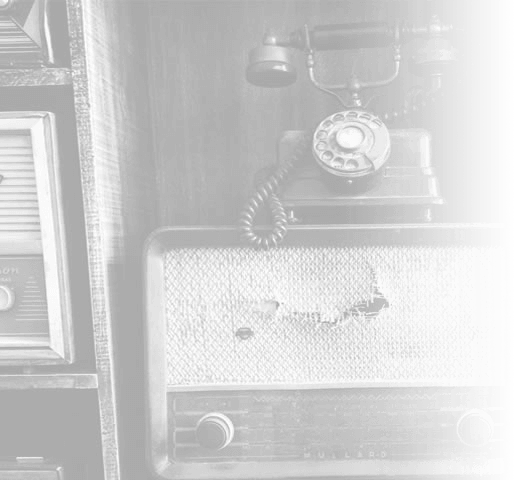 9 reasons your website doesn’t work on mobile.